Remember how Halo: Combat Evolved Anniversary Edition added terminals throughout the game, which revealed new story details from the point of view of 343 Guilty Spark and provided a connection to the then-unreleased Halo 4? Well, in an interview with Eurogamer, 343 Industries’ Bonnie Ross said the remastered version of Halo 2 will contain similar terminals that build up to the story of Halo 5: Guardians. These terminals, however, will come from the point of view of Thel ‘Vadam (the Arbiter). That’s not the only thing that will fill the gap to Halo 5, either. Nightfall, Ridley Scott’s live action series, will feature the new Spartan character, Agent Locke. It will tell Locke’s backstory, so you get to know and understand him. She hinted that the Halo TV series produced by Steven Spielberg (separate from Scott’s series) will be connected to Halo 5, as well, but we aren’t sure how. Even with the emphasis on Locke, the Master Chief is still the main character, and Halo 5 is still his story. 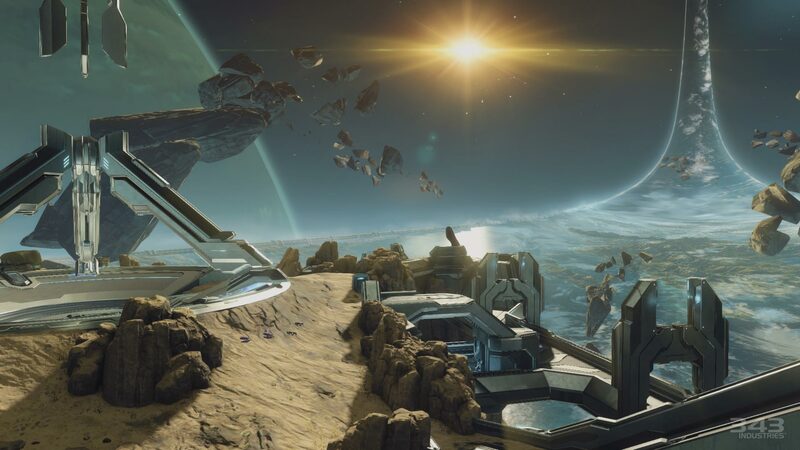 It’s starting to sound as though the Arbiter will have a big role, though, and we can’t wait to see what form that will take. If all that isn’t enough content to pave the way to the next game, the Master Chief Collection will also have a new prologue and epilogue that will “tie you up and leave you on the doorstep of Halo 5.” What do you think these new scenes will be like? In the recently announced Halo: The Master Chief Collection, we’ll finally get the long-awaited remake of Halo 2. And, unlike some remastered games, this is far more than a little sprucing up. From the official screenshots, it looks as though the game’s visuals have been completely redone to add more life and detail. Don’t take our word for it, though. CramGaming has compiled the screenshots of the old look versus the new look into one handy video. It looks pretty good to us. On the other hand, if you find yourself wanting the original Halo 2 look, you’ll be able to switch between the two as you play. What do you think? Is this how to remaster a game, or what? If you’re a Halo fan and you didn’t get to see Microsoft’s E3 press conference, we’re pleased to inform you that Microsoft definitely intends to start your Halo Xbox One experience this year, even though Halo 5: Guardians won’t be out until 2015. The good news is that there is a Halo 2 Anniversary Edition. The better news is that it’s not alone. And while you’re at it, check out some Halo 2 Anniversary multiplayer gameplay. Finally, since we haven’t lost sight of the next game in all of this excitement, don’t forget to watch the new and exciting trailer for Halo 5: Guardians. We had some theories about the new Spartan already…but is that our old friend Thel ‘Vadam (the Arbiter) talking to him? It’s hard to know what we should be more excited for. 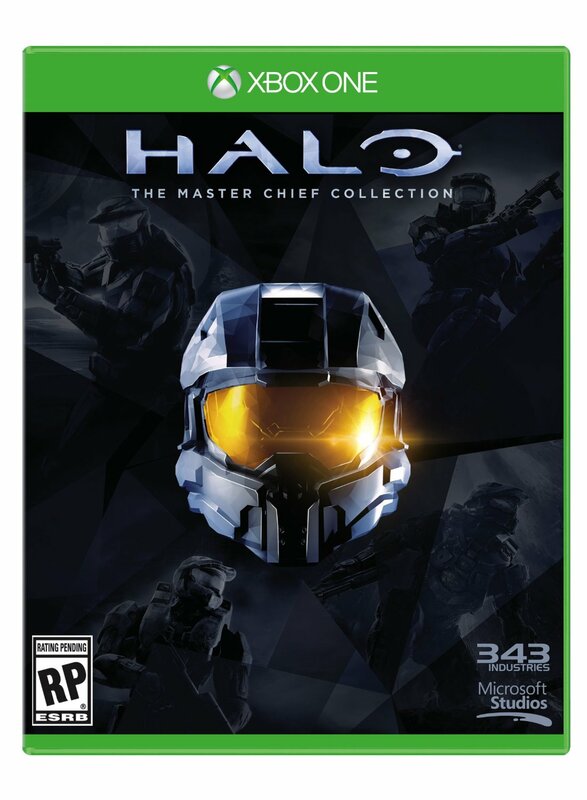 Share your thoughts on the Master Chief Collection and Halo 5 in the comments below. Last E3, Microsoft promised that the Xbox One Halo experience would begin in 2014. 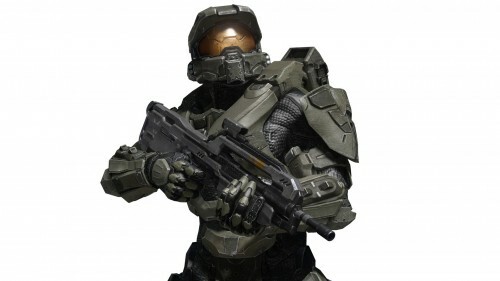 Most fans took this to mean Halo 5 would be releasing this year, but we now know that’s not the case. Other than Halo 5, the most popular guess fans have had for the 2014 Halo Xbox One game is a remake, or anniversary edition, of Halo 2. 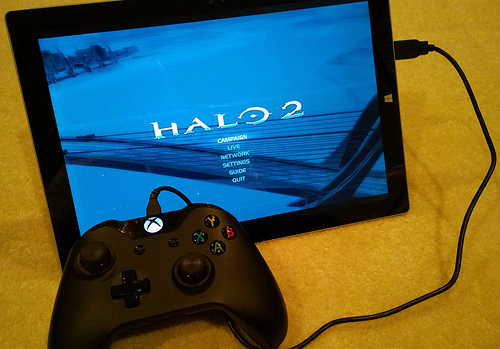 Microsoft has been pretty quiet on the subject, but when Larry “Major Nelson” Hryb announced that new drivers will allow you to use your Xbox One controller with your PC, he included a picture of an Xbox One controller being used with a tablet…which was running Halo 2. Now, this isn’t a definitive sign of Halo 2 Anniversary, but Major Nelson has to know the excitement surrounding that possibility. Why did he choose that game to show in the picture? Well, whatever Microsoft has planned for Halo, we’ll probably find out in just a couple of days at E3. 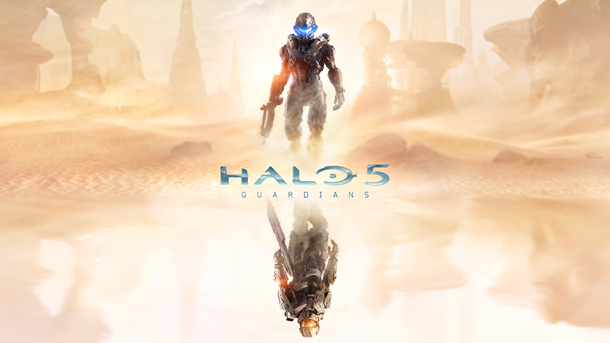 We also hope to learn more about Halo 5: Guardians. We still don’t know a lot about it, although we’ve been told it will feature strong female characters, despite the Spartan in the logo not being a woman. You know, if Halo 2 Anniversary is released in 2014 and Halo 5 is released in 2015, that will match up perfectly with the statement Steve Downes officially never made. We’ll know soon enough. Rumors are rampant about the next Halo game. Is it going to be Halo 5? Halo 2 Anniversary? Something else entirely? Microsoft is offering no official answers either way, but once again, a job opening at 343 Industries has caused additional speculation. Not only is this job directly related to Halo, but the reference to “external partners” supports the rumors that Saber Interactive and Certain Affinity, who worked on Halo Anniversary, could be working on a Halo 2 Anniversary. On the other hand, it could be related to Halo: Spartan Assault, which was co-developed by Vanguard. We’d be surprised if this was about Spartan Assault, although that title has cropped up a few times today. Its price was dropped to $9.99 on both the Xbox One and Xbox 360, and it was also announced to be on its way to Steam. Whatever the case may be, we hope to learn more at E3 in a few months! Share your thoughts and predictions in the comments below. Halo 2 remake coming for Xbox One, or Halo 5 marketing? Besides the next Halo game announced at E3 (otherwise known as Halo 5), Microsoft might have something else Halo-related in the works, and it might have something to do with Halo 2. Halo 2’s 2004 launch was preceded by an alternate reality game (ARG) known as I Love Bees. A series of puzzles, audio logs, and other clues came together as a viral marketing campaign to promote Halo 2. It was one of the first major ARGs used for a video game promotion and paved the way for future campaigns. Quinn DelHoyo, who works for 343 Industries, replied to the tweet with his own thoughts on bees. A fan asked if the bee conversation had something to do with I Love Bees, and what followed were joking tweets from Graeme Boyd (Microsoft’s social marketing manage, who would be in charge of such a viral campaign) and Major Nelson, which further suggested something was up. It feels like a bit too much to be a coincidence. Add in the fact that this year marks the 10th anniversary of Halo 2’s release, and we could be looking at early hints of a Halo 2 Anniversary Edition. On the other hand, Microsoft could be launching a new ARG to promote the next Halo game. Whatever the case may be, it can’t just be a harmless conversation about bees, can it? Win prizes by submitting your gaming cheats, hints, easter eggs and tips! What are the best Retro, Magical and Sci-Fi Game Bows Ever? A Gamer’s Thoughts: May I Cheat, Daddy? Cheats.co is a participant in the Amazon Services LLC Associates Program, an affiliate advertising program designed to provide a means for sites to earn advertising fees by advertising and linking to Amazon.com and affiliated sites.